Sales Lead Management for direct sales people is a common, popular subject, whether for outside or ----more----inside salespeople, but for distributors not so much. Industrial distributors are left to themselves to find a buyer. Most industrial companies with wide ranging distributors let them fend for themselves; no lead generation, no CRM system. Some feel that is why they have distributors so they don't have to generate leads. 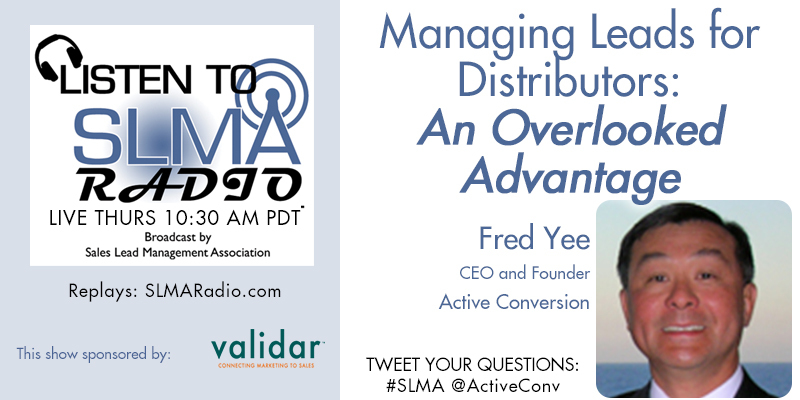 Fred Yee of Active Conversion talks about why industrial companies and their distributors are different and why distributors that get leads produce more than those that don't. The host is Jim Obermayer. Why the business process for the two is the same as direct even if they aren’t treated the same. Fred Yee, founder and CEO of ActiveConversion, has a history of running successful tech companies with high growth. After his previous company in web conferencing was acquired, Fred looked to solve a problem close to home - how to improve and simplify the sales and marketing process for companies with long sales cycles. This led to the creation of ActiveConversion, a marketing and sales platform customized for industrial sales and marketing. Fred holds a B.Sc. in computer science and completed the MBA Executive course for entrepreneurs at the University of Calgary. Fred has varied expertise through his career as a software developer, project manager, and sales executive. He is a recognized leader in the online marketing community. Yee has been recognized for two years running as one of the Top 50 Most Influential People in Sales Lead Management. He lends perspective to industry publications such as Industrial Distribution, Marketing Sherpa, and Technology Advice. His speaking engagements include the Dreamforce Conference (presented by Salesforce.com), as well as events like the Saskatchewan Trade & Export Conference, and CanWeld Expo. The ActiveConversion software was developed in 2007 and has become the benchmark in lead identification, lead management, and marketing automation for industrial companies. ActiveConversion provides a single tool to help convert interested buyers, measure marketing and sell intelligently. The platform is simple to use and easy to integrate into existing processes, which is why it has helped companies improve sales and marketing in over 500 projects across different industrieso.